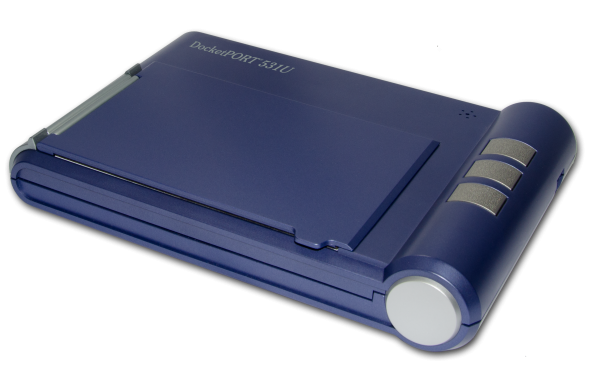 The DocketPORT 531U quickly captures images from ID cards or passports and easily integrates into various scanning applications. DockerPORT 531U is a mobile flatbed scanner with an oversize scan area, large enough to capture the full page of a European and American passport. Offering color, grayscale, black & white and infrared filter spectrum inks scanning capacity, it provides a convenient way to quickly inspect secure documents – passports, driver licenses, bank checks/documents, id cards, photos, and digital “watermarked” items. It works with any standard USB port and requires no external power adapter. Compact and easy to use, it integrates seamlessly into corporate and government security communities and USA Patriot Act compliance programs. Captures an image from ID card or passport in four seconds. Requires no special power; small, portable and durable. Provides durability under tough conditions and reliability for frequent and continuous use. Includes industry-standard TWAIN driver that is compatible with hundreds of software applications. Capture patient driver’s licenses, insurance cards, etc. Save time with desktop ID and bank check archiving. Power Consumption: 0.2W (standby), 2.0W (during scan), fully USB powered!